Now, when our minds are on refugees and immigrants, it is a good time to remember George Papashvily (1898-1978). George arrived – rather appropriately, from Georgia – in 1920s New York to start a new life in the New World. Before he got established in this country where ‘anything can happen’, he had numerous adventures and misadventures. He married Helen Waite, who was already a writer and helped George record his story in his own endearingly faulty English. 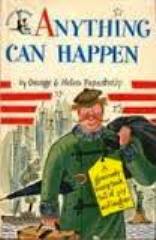 Anything Can Happen was first published in the US in 1945 and quickly became a minor classic. Their wedding is described in an early chapter and Helen is forever after called Helena Gerbertovna, because her father’s name was apparently Herbert. This Russian patronymic extends to one of Helen’s friends, Kathleen Patrickovna. Anything Can Happen opens with the boat arriving in New York harbour. George has spent all his money for food on board the ship and now has nothing to show the immigration officials. Before he can reach them, however, a recent immigrant comes to sell hats to the new arrivals. He persuades George that now as a soon-to-be American resident, he cannot possibly wear his lamb’s wool Georgian hat; no, because real Americans, like train drivers for example, wear these excellent striped caps, and if he wears one of these he will blend right in. So George trades his fine Astrakhan hat for a cheap cotton cap, and the generous cap seller even throws in a dollar. At an employment agency George is asked what he can do. He specialises in decorative leather-working, in particular crop handles. But his father wisely insisted that he should have a second trade as a back-up, so he also makes swords. The most famous story—or anyway the one I remember most clearly—is ‘Yes, Your Honesty’ about George’s court appearance. He is with some other Eastern European friends on a Sunday when the men decide to pick flowers for their girlfriends. A flowering tree is handy and so the others set about breaking off the branches to make bouquets. George objects that it is public property, but to no avail. He is told to hold a bunch of these flowers just as a policeman approaches and hands out fines for defacing public property. The others decide that it will be cheaper for them to pay the fine than to miss a day’s work, but George maintains that he is innocent and it would be dishonest to admit his guilt and pay the fine. His friend Sergei tells him it’s nothing.
. America and I’m a crook. Nothing, you think? How my father likes to hear such kind of news? In court George explains to the judge that he is not guilty of breaking branches, and that his friends all pleaded guilty to avoid losing a day’s pay. The judge asks him why he didn’t do that, too.
. ‘Because if I’m guilty I admit it, but if I’m not guilty, no man gonna make me say I am. After a few more exchanges the judge sees the basic decency of the young foreigner and his staunch if somewhat naïve truthfulness.
. And in front of that whole court room, he did. Probably the most laugh-out-loud chapter concerns the visit of a neighbour shortly after George, now married to Helen, has moved to a farm in rural Pennsylvania. A cohort of his mates helps George renovate the farmhouse. It is a hot day in July and most of them are shirtless and, in George’s case, wearing bathing trunks. George is in the living room feeding a cable up through ceiling to his friend Chalvah the electrician. In spite of Helen’s assurance that no neighbours will call until the curtains are up, there is a knock at the door. ‘My God! A lady! And I’m over seventy-five percent naked.’ George jumps into the nearest hiding place, which happens to be a grandfather clock. Chalvah doesn’t know what has happened to his cable-feeder.
. Mrs. Cleevendon to scream. She ought to have known the pants was coming. Chalvah, now poised between the ceiling beams, tries to make polite conversation with Mrs. Cleevendon and offers her a drink of wine from a bottle on the table, but, if it is possible to add to the awkwardness of the situation, she is teetotal.
. Helena Gerbertovna came in. At last. They began to have lady conversation. Maybe is gonna be O.K.
. everything, I thought to myself. Only too bad they don’t make clocks with a place to sit down. The ladies fall to discussing antiques and the talk soon turns to the fine grandfather clock. Helen, not knowing that her husband is inside it, goes to show the visitor the signature of the clockmaker on the inside of the case.
. Helena came across the room and threw open the door. George rushes out to Mrs. Cleevendon’s car.
. “Excuse me. I don’t know just how you make the arrangements here. I never lived on farm before. In the end Mrs. Cleevendon warms towards the kind-hearted foreigner and invites him and Helen to dinner the following week. Although Anything Can Happen concerns an Eastern European immigrant in the United States in the 1920s, with only a little lateral thinking the principles in it can be applied to poor young immigrants of any period in any country. Axiomatic truths in one culture are unheard of in another. As the United States is famously founded and sustained by immigrants, this kind of story has a special resonance there, but European countries, too, have had valuable contributions by newcomers who went from bafflement to comprehension by their own individual routes. The book ends with an Easter dinner at which the guests are of half a dozen nationalities besides American. Someone proposes a toast to “Home”. Sarah Lawson, a writer and translator, is an eleventh-generation American and a first-generation Londoner.